Accumulation of fat tissue under the chin can create an unsightly appearance of a double or triple chin. While liposuction cosmetic surgery is a popular procedure to treat this condition, not every patient may be ready to undergo an invasive surgery. Kybella injectable treatment is a highly innovative and proven non-surgical procedure now available for all such patients who want to reduce double chin without surgery. Dr. Brian J. Parker is a dedicated plastic surgeon providing cutting edge surgical as well as non-surgical aesthetic procedures. 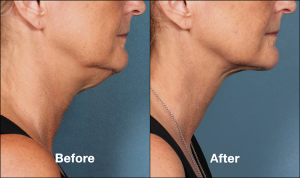 Dr. Parker now offers Kybella injectable treatment to eliminate unwanted fat deposits below the chin. Patients in Las Vegas and surrounding locations have an opportunity to receive this unique and proven treatment from Dr. Parker. In 2015, the FDA approved Kybella injectable procedure for the cosmetic treatment of moderate to severe fat deposits underneath the chin. Kybella is, in fact, the first and only injectable treatment to earn the FDA’s approval for cosmetic reduction of submental fat. Patients who want to avoid liposuction plastic surgery can choose Kybella to reduce fat pockets in the submental area. Safety and effectiveness of Kybella fat reduction procedure has been established through numerous studies and clinical trials. Successful test results and consistently positive feedback from patients and treatment providers has led to a growing popularity of this procedure over a short period of time. Leading cosmetic surgeon Dr. Parker receives patients from Las Vegas and nearby areas for Kybella. The active ingredient of Kybella is deoxycholic acid, which is naturally produced in the body. This agent supports the body’s fat absorption process. When Kybella is injected into the targeted fat tissue layers, it triggers disruption of the cell membrane of the fat cells. As a result, the fat cells are gradually eliminated from the area. If Kybella injections are administered wrongly, it may lead to unintended destruction of healthy tissue. Therefore it is critically important to choose a fully trained and experienced provider for Kybella. Amy G. Egan, M.D., M.P.H., deputy director of the Office of Drug Evaluation III in the FDA’s Center for Drug Evaluation and Research, recommends that Kybella injectable procedure should only be offered by licensed healthcare professionals. The treatment provider should make the patient fully aware about the potential risks associated with the use of the drug. According to Egan, patients should be clearly informed that Kybella has been approved by the FDA only for the treatment of submental fat. Its suitability for other fat areas in the body is not yet established. Kybella injections are administered directly into the fat tissue below the chin. Multiple injections are usually provided in a single treatment session. A maximum of six treatments may be given to a patient, with each session spaced at least four weeks apart. Kybella is presently available in single patient use vials. The drug must not be diluted or mixed with any other compounds. Results with Kybella will establish progressively with each treatment session.